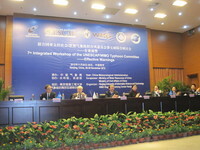 ADRC participated in the 7th Integrated Workshop of the Typhoon Committee which was jointly organized by the United Nations Economic and Social Commission for Asia and the Pacific (UNESCAP), the World Meteorological Organization (WMO) Typhoon Committee Secretariat, the China Meteorological Administration (CMA), and Nanjing University of Information Science & Technology (NUIST) in Nanjing on 26-27 November 2012. The more than 100 participants who attended the meeting included representatives from Japan, Lao, Malaysia, Philippines, Republic of Korea, Thailand, US, Viet Nam, Hong Kong and the Macao Special Administrative Regions, as well as representatives of the organizing institutions. The participants discussed their approaches to issuing "effective warnings," which was the main theme of the meeting. For the Disaster Risk Reduction Working Group, Japan's Cabinet Office gave a presentation on the damage caused by typhoons in 2012 and on ADRC activities such as the Visiting Researcher Program. The Typhoon Committee has two other working groups on meteorology and hydrology, in addition to the working group on disaster risk reduction. This workshop brought the three working groups together for an integrated meeting.